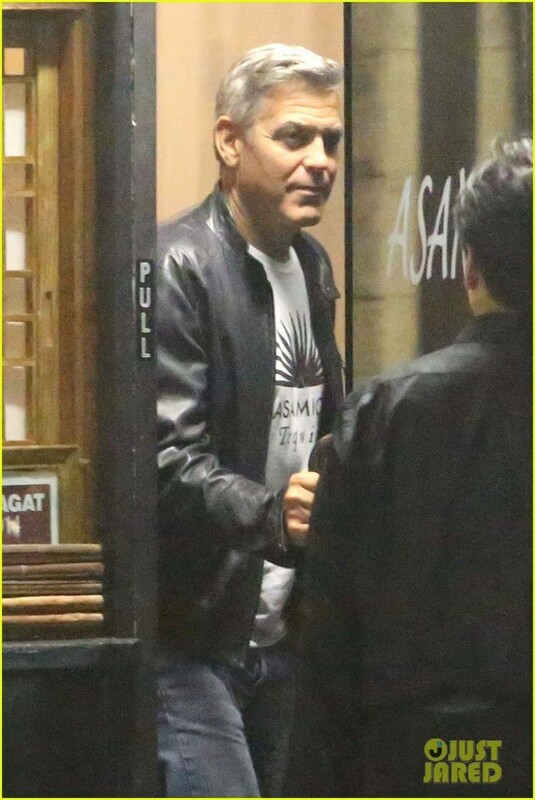 George Clooney keeps it casual while grabbing dinner at Japanese restaurant Asanebo on Sunday (October 19) in Studio City, Calif. 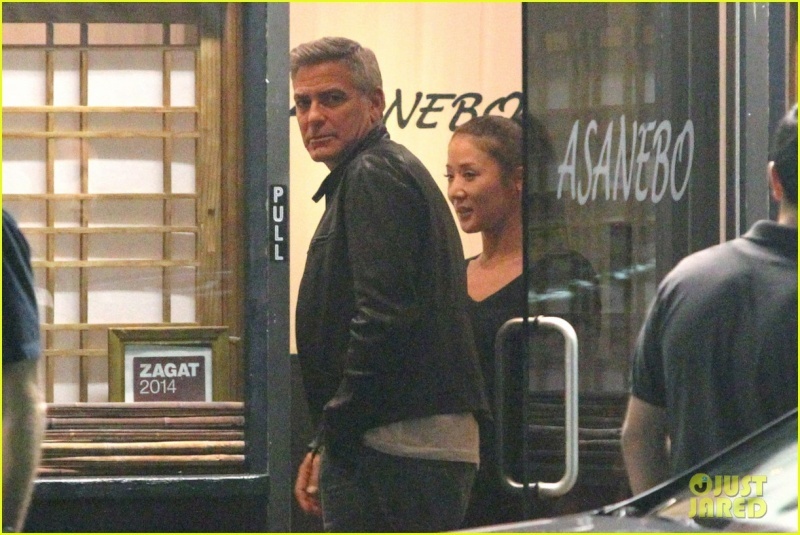 The 53-year-old actor was joined by a few friends for the dinner. It was recently announced that George‘s wife Amal Alamuddin has been named the most powerful woman in London on the Evening Standard‘s power ranking list, beating out Victoria Beckham and Nobel Peace Prize winner Malala Yousafzai. Well it obvious, the man doesn't cook, much. Wait a minute. Isn't he wearing the same outfit he wore to dinner with the boys? I mean I like the look but he could have at least gone with another colored Casamigos t-shirt. LornaDoone wrote: Well it obvious, the man doesn't cook, much. bg, I think during the wedding weekend we've seen the happiest George ever. 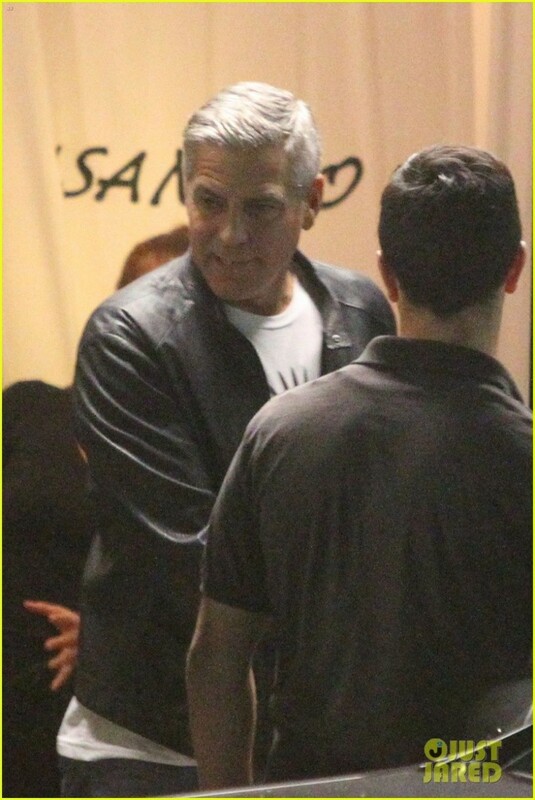 Look at those wedding/civil wedding photos and you'll know he is not happier without Amal. George might spend some time with the Coens discussing the production on Hail Caesar next month in LA. Someone on IMDb says his brother spotted Joel riding a bicycle in town the other day. Donnamarie wrote: Wait a minute. Isn't he wearing the same outfit he wore to dinner with the boys? I mean I like the look but he could have at least gone with another colored Casamigos t-shirt. 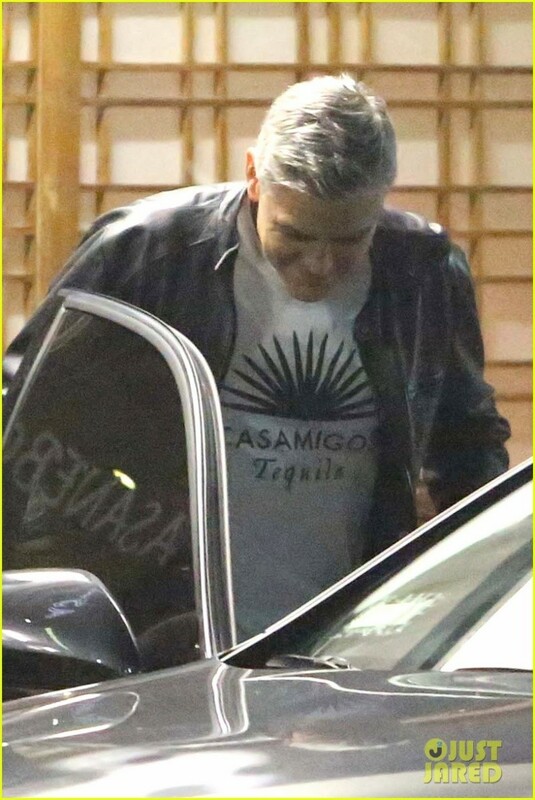 He,does wear a different colored Casamigos shirt. He looks normal , but at his wedding he never looked happier never ever saw him smile so much. He looks just awful. I'm shocked. He looks exactly like my dad who is 75. Sorry this does not look like a man who is in love and a newlywed no way. Most men are walking on air in the month after their wedding. George looks shocking. There has been a huge physical deterioration in him since the wedding. Re the comments that George looked happy on his wedding day well he was facing a wall of paparazzi and it was one hell of a show. This is the truth of how marriage has affected him and it's not pretty. I also want to point out what kind of newly married and deeply in love guy gets off his face on booze within 2 weeks of the wedding like in those pictures with Rande the other day? Maybe the one week he spent with Amal in that English mansion he bought on the island didn't go too well or something. Or maybe he's been online reading all the comments about her and the negative articles and realises he's made a big mistake. Who knows. Or maybe he's just tired! Give the negative-Nelly bit a rest! globalchick wrote: He looks just awful. I'm shocked. He looks exactly like my dad who is 75. Sorry this does not look like a man who is in love and a newlywed no way. Most men are walking on air in the month after their wedding. George looks shocking. There has been a huge physical deterioration in him since the wedding. Well he is a 53 year old newlywed, so I think we need to give him a little leeway on the "looks like he is walking on air" expectation. Never in the reign of pig's puddin' ! Wonder if Amal does laundry? In my opinion, I doubt it. 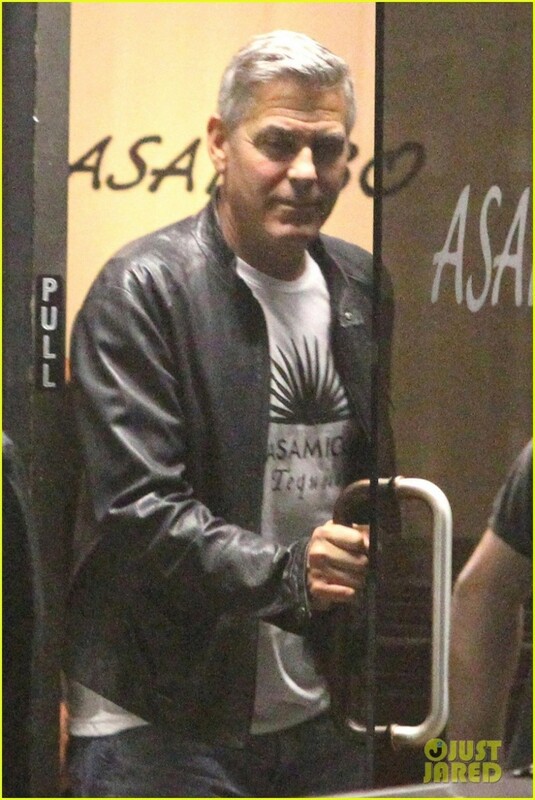 Gosh, not the Casamigos T-shirt again? Who saw that coming, eh? 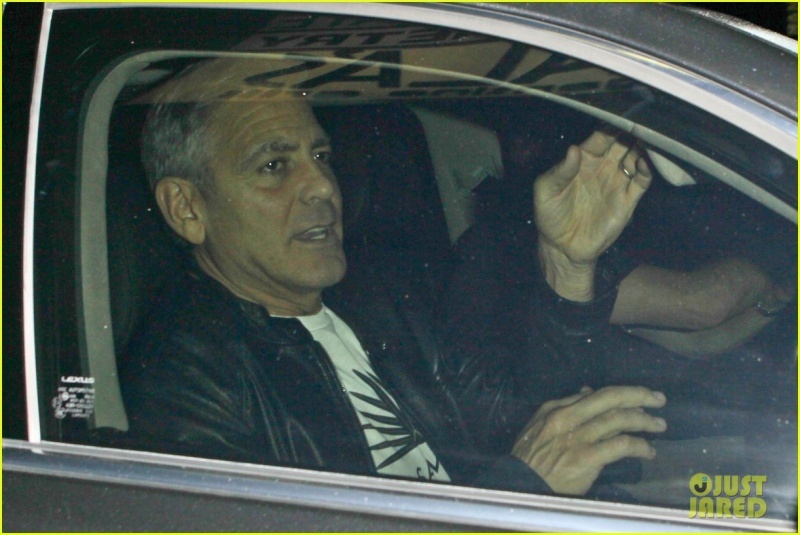 Still, it's nice to see George out and about again. I for one am not complaining about sightings of George seeing as they're getting so few and far between nowadays. I bet George does laundry. And ironing. And sewing. He is quite handy . Remember when Elisabetta had a wardrobe malfunction at the Oscars and George actually stitched up her dress. And a former gf said he was quite suburban, able to do all things home related. Not so true Donnamarie. He did NOT sew Elisabetta's dress. You are so right! 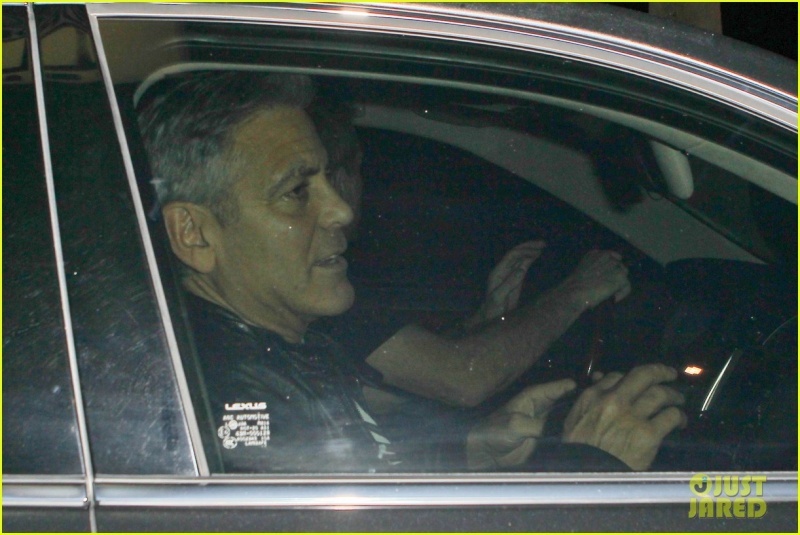 George never looked tired before he met Amal! Its definitely all her fault!! He said he sewed it up in the car, where it had ripped apart. globalchick wrote: Most men are walking on air in the month after their wedding. No they don't! Where do you get this tripe from? 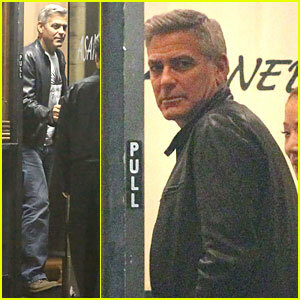 globalchick wrote: George looks shocking. There has been a huge physical deterioration in him since the wedding. He doesn't look great here, but perhaps you've missed the many similar comments about George the past few years? My guess is that his injury is hurting him a lot - look at the stoop he's developed this past year or so. He's in pain every day and he's aging. These things happen. Hah - just thought of this! Perhaps he looks 'shocking' because he's sad, depressed, lonely and missing his wife? globalchick wrote: I also want to point out what kind of newly married and deeply in love guy gets off his face on booze within 2 weeks of the wedding like in those pictures with Rande the other day? I venture to suggest any man who likes to get off his face on booze with his best mate before he got married. This is marriage we're talking about, not malaria. It doesn't change people and transform them into different beings with completely different hobbies, habits and lifestyles, particularly not when the man we're talking about is 53 years old and set in his ways. A man who likes to spend a lot of time with his friends isn't suddenly going to stop enjoying his time out with friends just because he got married. A wife who loves him isn't going to stop him, either. globalchick wrote: Or maybe he's been online reading all the comments about her and the negative articles and realises he's made a big mistake. Who knows. Personally, I think he's smart enough to figure out his mistakes without assistance from the online peanut gallery. 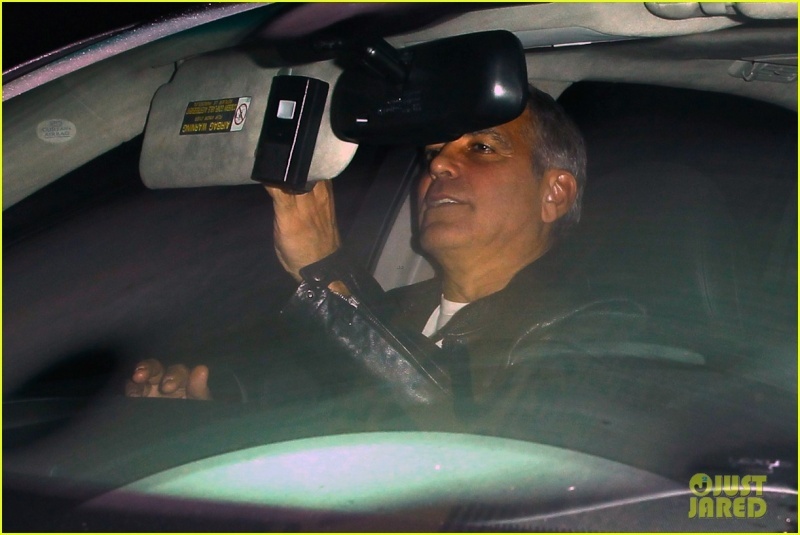 Does it never cross your mind for one second that George Clooney has a MUCH better insight into his own life than you do and has made his decisions accordingly? Katiedot wrote: He said he sewed it up in the car, where it had ripped apart. And he's said a lot of things that we know to be untrue, just for the laugh. Or maybe he keeps his sewing kit in the same pocket with his flask. Melbert, I don't remember if it was Access Hollywood or E News. They were interviewing one guy who was a behind the scenes person on the red carpet. He was critiquing the fashions and hair on the red carpet. He was with another commentator. He specifically said that Elisabetta came into wherever celebrities go if there need to be fashion or hair adjustments because her dress had ripped in the back. They started to stitch it up and George came in and took over. He said he had lots of experience with this kind of thing. He did a cross stitch to repair the dress and this guy said he did a great job, really knew what he was doing. This guy who spoke about this also said that he thought Elisabetta was one of the best dressed (she wore a strapless red gown) at the awards show and looked the most natural. I didn't agree at all with his view on her. I doubt seriously that George goes online to read about himself and his wife. George may look tired. Some of the pics of him look better than others. We can all assume he was drinking but so what? He doesn't look drunk to me. When he goes out with his friends he is going to drink. They all do. What is the big DEAL. The guy was having two nice evenings out with his friends. Leave him alone. He probably misses Amal. She probably misses him. I love reading the comments here. So much fan fiction. I do agree that George does look like he's in pain quite often. But hey, nothing a little smooth tequila can't fix. So who was he having dinner with this time? He really doesn't look well in these photos. He looks very tired, and in the top shot he looks mad as hell. Wonder what put that look on his face. PAN - Maybe none, unless his folks want to go. Didn't one of the recent articles say that there are 2 parties planned for LA too? If true, I'd guess those are the parties his friends would go to. Yeah, he has that 'chronic pain' look etched into his face, and he looks tired. Neither of those is unexpected, considering his schedule the last month or so. Poor baby. Chronic pain is what I have been thinking too when I have seen both Saturday and Sunday pics and in the pics with Rande he looks a little drunk. Health issues are probably the reason he is ageing so fast although I am sure drinking and tanning adds too it as well. I fear his health problems are going to get worse as he get older and he is only 53. I think George needs a wife that is more at his side taking care of him. It is amazing how people read so much in to a few random photos of an evening. Reminds me of an photo of Bruce Springsteen leaving a hotel with his wife and she was crying. It was immediately jumped on that they had a huge fight - turns out a relative had died. Speculate all you want, we will never know what's going on in his head. jd68 I feel the same way. Way too many times we see a set of pictures that are taken maybe in a 30 second span when someone is not there to be on display and you can read almost anything into their expressions. The lighting is not good and as the subject you are not responding to the camera. We don't know what, if anything is going on with an expression or lack of expression. We want to know so we start to analyze. I do it sometimes myself. The comments about his age on this forum reveal your repressive ideologies on aging. 53 is young. And he's hot! If you're not there yet, you will be soon enough...so make sure you're prepared to be dismissed as 'old'. It's funny none of us know George , yet everyone thinks they know what his looks mean. If he were in pain seriously doubt he would be out sitting in a restaurant for hours. The lighting is pretty bad in these pictures so he may look better than shown in these shots.